Appearance: Standing at barely five-foot even, Roulette is a little bit on the scrawny side of things. Untidy, and wild looking midnight curls fall down to the tops of her shoulder, framing the face. Red eyes and full lips complete said face. Youthful almost glossy ebony skin shows throughout, only interrupted by a faint mark on her left shoulder blade. The mark is in the shape of a star and is nothing more than a birthmark. In terms of the body's frame, she sports a small bust and equally small rump too. 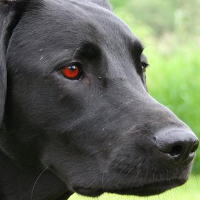 Once on all fours, the same red eyes are visible. The birthmark that carries over from her human form is also seen despite her black coat of fur. It's just a little harder to see. Roulette, like any other race, has her ups and downs. But one thing she has gotten good at is hiding any negative feelings from others. Choosing to project a positive outlook rather than appearing to dwell on the negatives. But even on her worse days, she can't bear to stay unhappy for long. It may take a few days at most, but she returns to a happy state of mind pretty quick. If there is room to work with, she loves to run as fast as she can. Whether this behavior is her animal or not isn't clear as she does this regardless of either form. Exercise is one thing, hoarding and hiding shiny objects is an entirely different story. It's a quirk of hers, but Roulette loves shiny things, and if she can have said object then it will be hoarded and hidden somewhere. In fact, she is often distracted by shiny objects. During times there is nothing going on, she is prone to becoming bored and will seek to alleviate this by either foraging for something or sitting down to chew on a pair of shoes, bones, etc. It should also be noted she likes to "people watch" when she sees someone doing something of interest. Or if they are doing something that seems odd to her... Other than that, watching others has its perks! At least that is what she thinks anyway. Born in the city of Riverfall, Roulette was born to Kelvic parents who were bonded to the same human named Leto Wicker. Though at an early age, she kept calling him "gramps" instead of "Leto" or "Master". But instead of correcting her, Leto simply let her call him this and even raised her much as a grandparent might with their own grandchild. Although he did keep her from bonding to anyone, including himself. With her parents raising her, she watched a few of her older siblings and sometimes followed them around the city as soon as she could crawl. And when Leto found a spare moment from his work, he was walking around the city looking for Roulette. It was clear the girl had energy. About three and a half months of age, she experienced an acute awareness of her animal form. What was once dark brown, almost black eyes, had now changed to a red color. After this, her mother kept a close watch in order to help her with shifting for the first time. Once this happened, they discovered her animal looked a lot like a Bozderon Shadow Dog. The red eyes and her star birthmark were visible. Granted, the birthmark was a little harder to see to the naked eye. During her brief childhood, her parents and Leto tried their best to get her to be still and learn. But as most Kelvics her age, she held little interest in basic studies like reading, writing, maths or the sciences. Instead would shadow behind her parents and older siblings whenever they were working around the city doing various jobs for Leto. It wasn't until she was about a year and a half old that Leto noticed Roulette's black pelt almost looked like it was partially matching the shadows of the corner she had been sitting in at the time. By this point, she was just a little bit calmer and sometimes took to watching others whenever there wasn't much going on and nothing to really chew on either. During this time, she took to learning the lore behind Stealth: Blending into the shadows. While she became aware of her ability to do this, she still had much to learn about it. Right about the same time is when she also took an interest in carving small figurines made of wood after watching a friend of hers. These wooden figurines held much detail despite how small they were. So it was suggested that she study the lore of Carving: Miniature Wooden Figurines. While starting to study these, Roulette felt another urge. To locate a bondmate. When she spoke to her parents about it, Leto stepped in and suggested traveling to the settlement of Syka. Agreeing with him, he insisted on paying her fare to travel by boat. As it happened, there was a ship of traveling Svefra that would be heading there after they were done with trading. Taking a pack with only the necessities, Leto had slipped something into her traveling pack without her knowledge. It was a small marble carving of a bear that had been one of his heirlooms. He often spoke of how his own grandfather had carved it. That aside, Leto had given 100 mizas for her to start off with when arriving at Skya. Telling her to use it wisely. Roulette bid her parents, siblings and grandfather farewell before boarding the ship. Though she had never been on a ship of any kind while out at sea, the girl stayed seasick for the first few days. After that, it was no problem. While she traveled with the Svefra, she learned to fish and even got a crash course in swimming after losing her footing and taking falls directly into the salt water. But it was fun, if not terrifying at first. After talking to the Lia a few times, she often did work on the ship for them to earn food and helped them without question. And if someone broke out in song, she would join in happily if they let her. But it wasn't all sunshine while traveling by ship. The weather out in the open waters could change quickly. Whenever harsh weather came, she often had to stay below deck and hang onto something sturdy just to stop from being tossed around like a doll. When the day droned on, she found herself chewing onto the pair of shoes she had in her pack. That's when the discovery of the small marble carving was made. Recognizing it was easy as she had seen it a thousand times over. It belonged to Leto, the man she called her grandfather. Even if they weren't related by blood, she associated him as such. Seeing this carving brought a smile, but also tears. During all the excitement, she did miss her family. Maybe someday they could meet again. And if not, she still carried their memories with her. Upon hearing footsteps though, Roulette was quick to wipe away any tears that had come to her red eyes. After what felt like ages, the ship did finally meet its destination. Stepping off, she left with new experiences under her belt. Thanking the Svefra, she wandered off in the direction they pointed her to. If she was going to stay here in Syka, she would need to find a place to settle down to get her bearings. Last edited by Roulette on April 2nd, 2019, 4:34 am, edited 2 times in total. Last edited by Roulette on April 2nd, 2019, 4:09 am, edited 1 time in total. Last edited by Roulette on April 2nd, 2019, 4:10 am, edited 1 time in total. 37th of Spring, 519 AV: Went exploring into Estuary Cave.